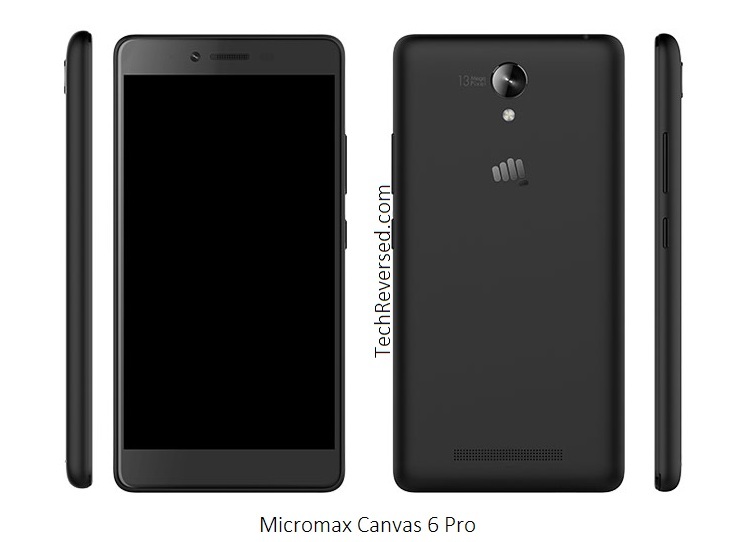 The Micromax Canvas 6 & Canvas 6 Pro are now official. 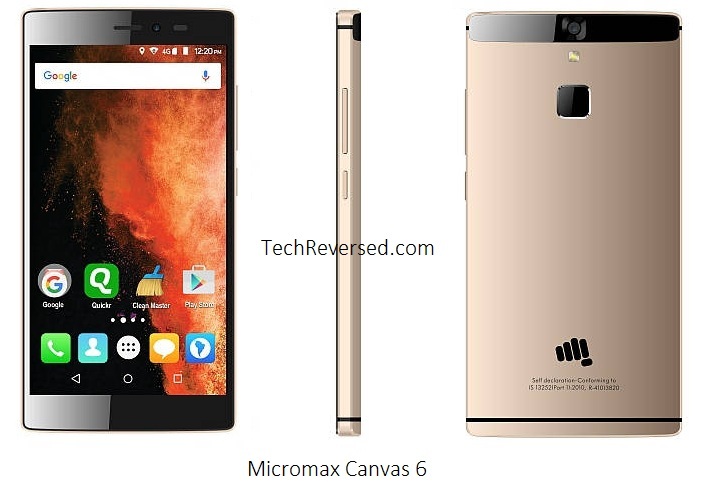 The Micromax Canvas 6 is the first phone from Micromax to feature a Fingerprint sensor. Talking about the specs The Canvas 6 sports a Octa Core Helio X10 CPU, 5.5 Inch Full HD display, 3 GB Ram. Whereas the Canvas 6 Pro sports a Octa Core Helio X10 CPU, 5.5 Inch Full HD display, 4 GB Ram. Talking about the design the Canvas 6 has a metallic body whereas the Pro variant has a plastic body. 4 G LTE Cat 4 Support. (Up to 150 Mbps Download & 50 Mbps Upload speeds). Full H.D Display. (~401 p.p.i pixel density). 13 MP Rear & 8 MP Front camera. 32 GB internal storage which is expandable Up to 64 GB via Micro SD card. Corning Gorilla Glass 3 Protection on Screen. Octa Core Helio x10 CPU. 13 MP Rear & 5 MP Front camera. 16 GB internal storage which is expandable Up to 64 GB via Micro SD card. OS Android OS v 5.1 (Lollipop). Android OS v 5.1 (Lollipop). DISPLAY 5.5 Inch Full H.D IPS Display. Resolution 1080 x 1920 pixels (~401 p.p.i pixel density). 5.5 Inch Full H.D IPS Display. Resolution 1080 x 1920 pixels (~401 p.p.i pixel density). CAMERA REAR 13 MP (f/2.0 Aperture). Resolution 4128 x 3096 pixels. With Phase detection auto focus and LED flash. | Features: Geo-tagging, touch focus, face/smile detection, panorama, H.D.R. | Video Features: 1080 p@ 30 fps, H.D.R recording | FRONT/SELFIE CAMERA 8 MP. REAR 13 MP (f/2.0 Aperture). Resolution 4128 x 3096 pixels. With Phase detection auto focus and LED flash. | Features: Geo-tagging, touch focus, face/smile detection, panorama, H.D.R. | Video Features: 1080 p@ 30 fps, H.D.R recording | FRONT/SELFIE CAMERA 5 MP. NETWORK 2 G/3 G/4 G L.T.E Cat 4 Support. 2 G/3 G/4 G L.T.E Cat 4 Support. BATTERY Non Removable Li-Ion 3000 m.Ah. Non Removable Li-Ion 3000 m.Ah. STORAGE 32 GB Internal. Expandable up to 64 GB via micro SD card. 16 GB Internal. Expandable up to 64 GB via micro SD card. RAM 3 GB. 4 GB. FEATURES Fingerprint Sensor. | Full H.D Display. | Corning Gorilla Glass 3 Protection. | 4 G Support. | 3 GB Ram. | Octa Core CPU. Full H.D Display. | Corning Gorilla Glass 3 Protection. | 4 G Support. | 4 GB Ram. | Octa Core CPU. SENSORS Fingerprint, Accelerometer, proximity, compass. Accelerometer, proximity, compass. CONNECTIVITY Bluetooth v 4.1. | W.I-F.I 802.11 a/b/g/n/ac, W.I-F.I Dual Band, W.I-F.I Direct, Hot spot. | Dual SIM (G.S.M) Size Micro SIM & Nano SIM. Bluetooth v 4.1. | W.I-F.I 802.11 b/g/n, W.I-F.I Direct, Hot spot. | Dual SIM (G.S.M) Size Micro SIM & Nano SIM. Unfortunately there is no official price and launch date is confirmed for the device. But we can expect it to price around 12490 – 14890 Rupees in India. It is expected to be available by the end of April or in Early May. It is now available for pre order at Micromax’s Official site for a Pre booking amount of 1000 Rupees. It is priced at 13,999 Rupees in India. (Around 210 US $). It will go on sale from 20th April. For More Tech Updates Join Us on Facebook. Next story Creo Mark 1 | A New Phone Every Month?